It is with a heavy heart that I am bringing this article to life. In my Hedwig Inspired article, I mentioned a makeup brand called Lime Crime. The name was followed with high praise of the quality in the products and a subsequent rave review was to follow in the coming weeks. I am saddened to say, that I am retracting my support for Lime Crime. This brand was not new to me by any means. I had heard nothing but good things from beauty bloggers about the quality of the products and the unique things available. I followed the products religiously. On February 6th, I bit the bullet and purchased three products: the eyeshadow helper, a liquid eyeliner, and the Black Velvet matte black lipstick. I spent $54 on everything, and got free shipping. The products themselves are amazing. Fast forward to February 25th. I received an email from the company, saying that anyone who bought from their store between the dates of October 4, 2014 and February 15, 2015 were at risk of their information being hacked and they would send a physical letter to those who had their information taken. Three days later, my letter came. Cue the panic attacks. Yes, I have cancelled my card and notified every single company that charges things to that card every month that the account is no longer active and why. What is the point of this then? Besides being a very cathartic thing for me to do at the moment, I wanted to write this down for everyone’s sake. 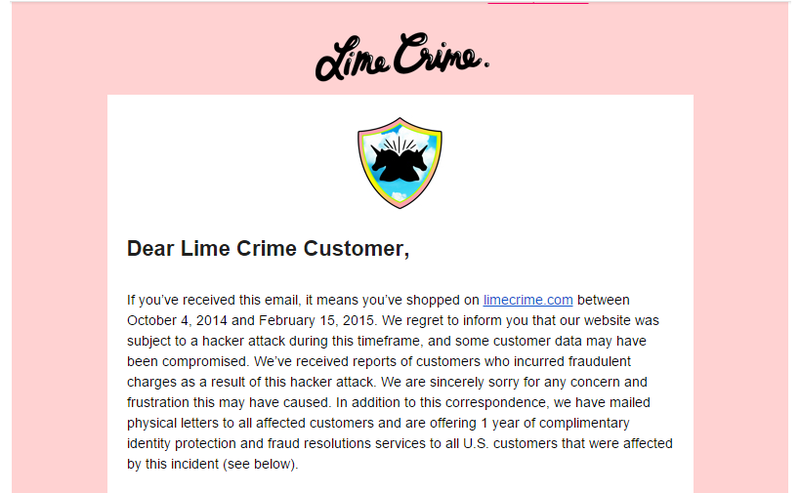 I didn’t know about the shady history of Lime Crime and the owner. Frankly, I’m not even going to get into it here. If you really want to know, just Google it or go to Youtube. What bothers me about this, is I trusted this company to have enough brains to have their security in check, and they didn’t. They let people’s information be at risk and have their lives RUINED for FOUR MONTHS. So, I am sorry I ever mentioned the name of this company in a post. I am sorry if it made you check out their website and want to buy things from them. I am sorry that I could have put you in harm’s way. I know I am not a famous beauty blogger whose word is law, but I would hope that my opinion counts for something. And my original opinion could have put many people at risk. If you were like me and purchased from them, check your information! Even if you did not get a letter. The video below was the most informative video I watched about this mess. Once again, I am so very sorry for starting to lead you in a dangerous path. It is not my intention to talk about a product positively in hopes of one day getting free stuff. Or even to kiss the ground they walk on. I show and use products I genuinely love. I was one of the unlucky ones who credit card info actually got stolen. With a matter of a few hours there were dozens of charges to my card (which actually is my debit card) and some for thousands of dollars. Had my bank not noticed this right away my bank account would have been completely drained within an hour, literally. Charges from all over the places…. online gambling sites, places in Asia, places in China, places in Italy, a couple of stores in Hawaii. Someone even tried to buy a macbook from apple.com. Thankfully I have a zero fraud liability with my bank and they reimbursed me every penny and shut off my card right away. But it was a nightmare and heart wrenching at the time. When I noticed it all happening, my heart was in my throat. I will never ever purchase from them again.